For the start of this wedding ceremony on the patio of the Chambers Bay Golf Course in University Place, Washington, the bride and her father pulled up the circular drive in a chauffeured antique Rolls Bentley. 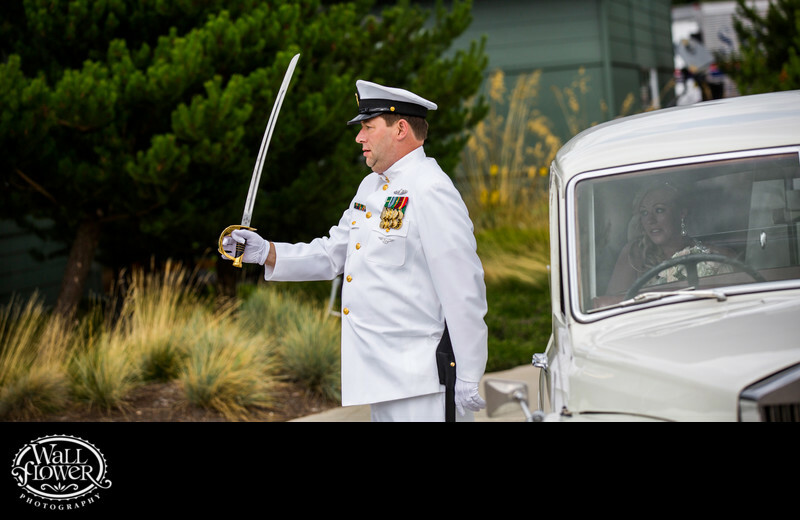 As the bride watched from inside the car, struggling to control her emotions, her father got out and saluted the groom and wedding guests with his sword. Then he helped his daughter out of the Bentley and escorted her up the aisle to the altar where the groom and wedding party were waiting. Check out the Places photo gallery on this website to see an award-winning photo of their wedding ceremony! To see lots of photos of weddings photographed by Wallflower Photography at this venue, visit our Chambers Bay wedding portfolio website at www.chambersbaywedding.com.